How much wood could a boychick chuck if a boychick could chuck wood? Sometime during the renovation of our house, Tim decided we needed to install an energy-efficient stove in the fireplace. He was all excited that it would "burn clean" - whatever that means. I did warm to the idea, however, when he said it would allow us to burn wood all winter and heat the house to levels not allowed me since before our marriage. I have to admit, the stove, plus the extra roof insulation we put in, really does the trick. In fact, since I have a home office and can deduct utilities, after sending off the info to our tax guy, he told me to recalculate, "unless you're sitting in the dark and cold all winter." Anyway. 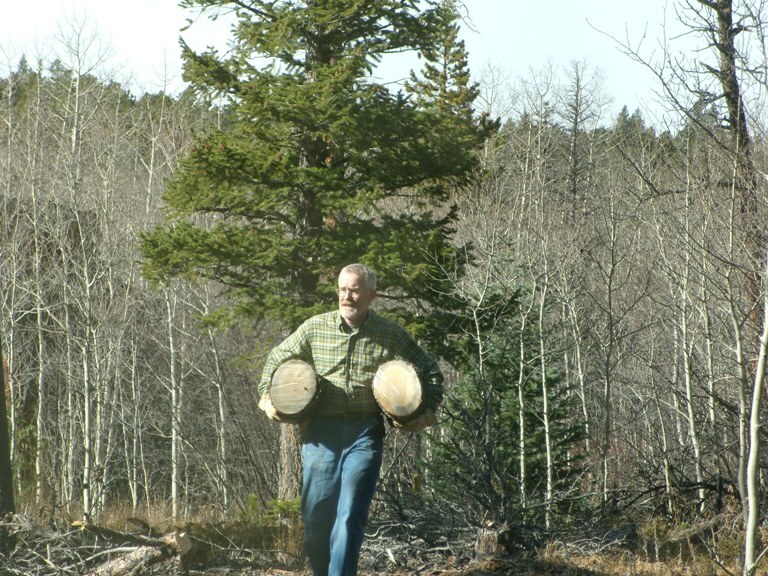 I wouldn't have agreed to the whole stove thing if I had known I was expected to participate in the wood-gathering process. 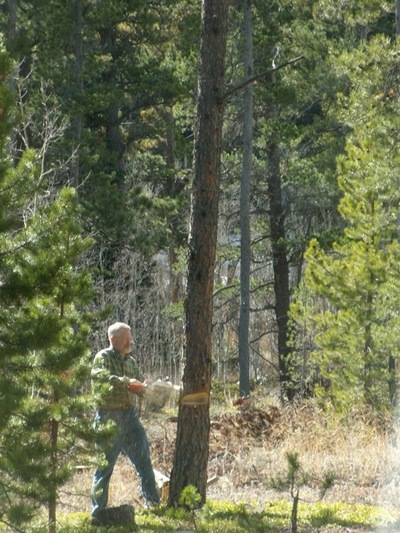 Tim got a permit to chop down (dead) trees for wood on BLM land. He asked if I wanted to come. D: Why would I want to do that? T: We could spend time together. Outdoors. 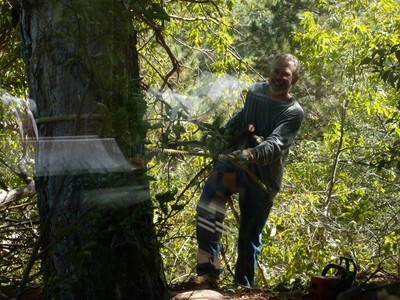 T: Well, there is the part where I cut my leg off with the chain saw. So, it sure would be nice to have company. What does he want from me? Our cell phones don't work out there, I don't know how to drive his truck, and didn't he remember I'm a shrink? D (in case of accident or injury): Gee, sweetie. How does it feel to have your leg severed? After he agreed to treat me to lunch, I agreed to go. He seemed surprised. D: (Magnanimously) It's the least I can do. T: Oh, so you've done the calculation? Once we got up to Nederland, the nearest "town" to the area we were headed (and even weirder than Boulder. Doubt it? How about the annual festival to Frozen Dead Guys?) Tim announced he wanted to stop at the grocery store for donuts. He figured he needed the sugar for fortification. It's apparently part of the tree-cutting ritual. Who knew? The woman at the check-out was quite impressed that he'd actually written the price and number of donuts on the self-service bag. She said she could tell he wasn't from around there. Since Tim was driving, I needed to nagavate... er, navagate. Needless to say we missed several turns, undoubtedly because he insisted I use the BLM map. Let me tell you, those forestry service people have about as much conception of forests as I do. What's with all the squiggly lines? While I was busy trying to read the thing, Tim employed one of his favorite tricks and turned into exactly where he wanted to go, saying "Let me pull off the road, so I can help you with the map." By the time I look up to growl, "I don't need your help," I realize he doesn't need mine. He actually looks like he knows what he's doing. This is the part where pretending I'm doing something really important and can't be disturbed comes in handy. 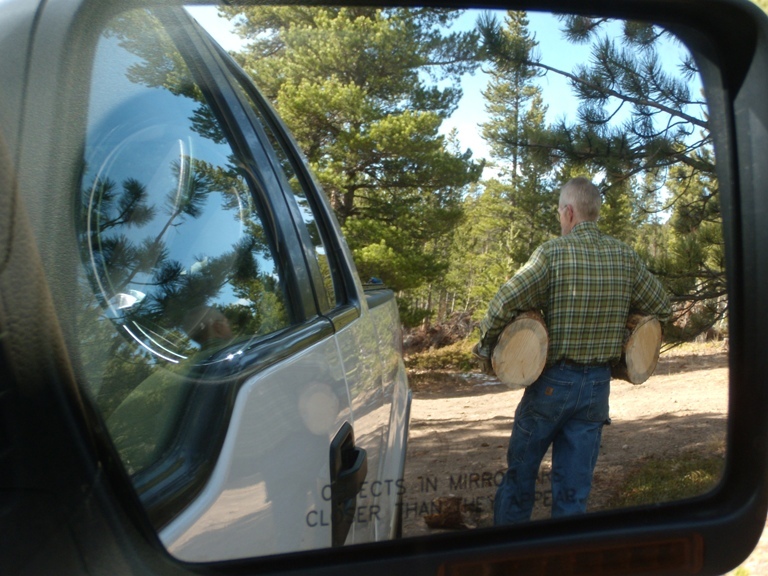 Upon hearing that I had accompanied his son, Bob wanted to know, "Did Doreen help you put the logs in the truck?" Oh, dear readers. Surely you know me better than Bob does. 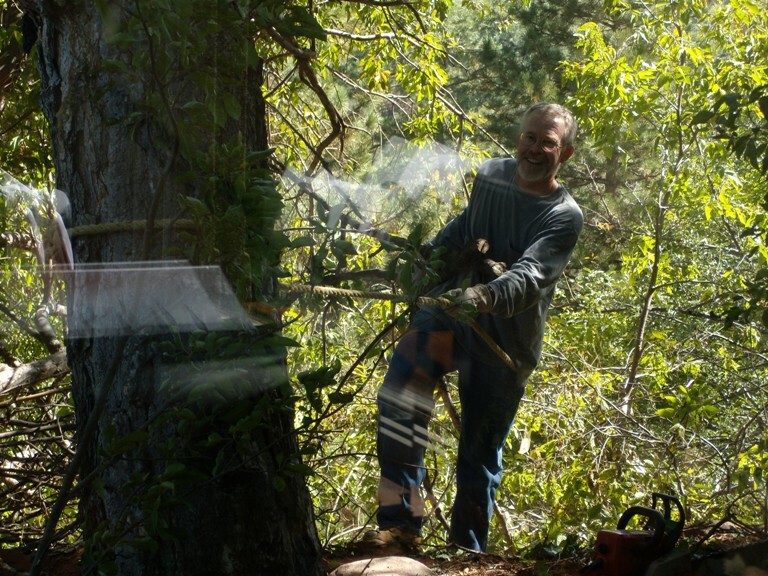 Tim explains: I was cutting down a dead limb on a steep hillside, so before I cut the limb, I tied a rope to one end and tied the other end to a big tree in the yard so that when the limb was cut loose, it wouldn't tumble all the way to the bottom of the hill. Yeah, get all Newtonian on me, with your precious Physics for Majors and lofty Law of Gravity. I prefer Newton's First Law. You know, the one where a body at rest stays at rest. This page contains a single entry from the blog posted on December 7, 2009 6:35 PM. The previous post in this blog was A Passel of Princesses. The next post in this blog is An International Incident.